Once it punts again at the June meeting owing to Brexit worries it will have effectively pegged money market rates at the zero bound for 90 straight months. There has never been a time in financial history when anything close to this happened, including the 1930s. Nor was interest free money for eight years ever even imagined in the entire history of monetary thought. So where’s the fire? What monumental emergency justifies this resort to radical monetary intrusion and repression? The truth is, there can never by an honest shortage of “aggregate demand” because the latter is nothing more than spending for consumer and capital goods that is financed from the flow of income and production. As “Say’s Law” famously and correctly insists, “supply creates its own demand”. Say's law was generally accepted throughout the 19th century, though modified to incorporate the idea of a "boom-and-bust" cycle. During the worldwide Great Depression of the 1930s, the theories of Keynesian economics disputed Say's conclusions. Why is Stockman wrong when he writes that "US actually didn’t borrow its way out of the Great Depression; it saved its way out"
As I documented in The Great Deformation, total public and private debt at the end of 1938 amounted to 210% of GDP, but by the end of 1945 it had dropped to 190% of GDP. ”Det som satte stopp för trettiotalsdepressionen i USA var ett massivt underskottsfinansierat program för offentliga arbeten som kallas andra världskriget”. while those public bodies and big corporations still guaranteeing an income to their members face large and mounting deficits. And yet many assume equity returns of 7 per cent. The baby boomers, those born between 1946 and 1970, were the richest, and largest, generation that the world has ever seen. 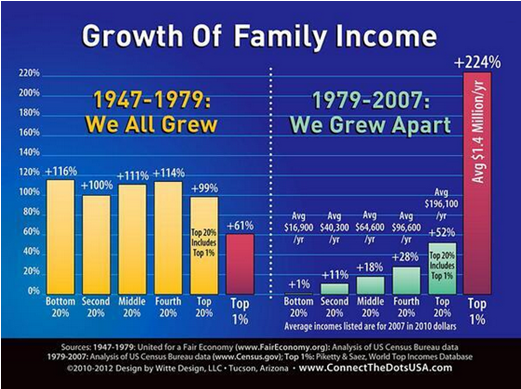 Unsurprisingly, they created a truly golden age for housing, auto sales and overall consumer demand. "I do believe in general that there will be a day of reckoning unless we get fiscal stimulus," he said, pointing to the Federal Reserve's maintaining low interest rates, and potentially creating "tremendous bubbles." On the fiscal side Icahn argued that "you certainly could do more spending." "The Republican party that I used to be more sympathetic with — I'm right in the middle now, although as you know I'm for (GOP front-runner Donald) Trump — but what I would say is Congress is in this massive gridlock obsessed," he said, explaining that the Republican-controlled Congress is "obsessed with this deficit to a point that I think it's almost pathological." Corporate America is swimming in cash. There is no great news about this, and no great mystery about where it came from. Seven years of historically low interest rates will prompt companies to borrow. A new development, however, is that investors are starting to ask in more detail what companies are doing with their cash. And they are starting to revolt against signs of over-leverage. So long as at least one of the four rating agencies judges Portugal to be worthy, its government debt remains eligible to participate in the ECB's bond-buying program. But if the country drops to sub-investment grade at all four, the ECB’s own rules forbid it from buying any more Portuguese government securities - purchases which have ballooned to almost 15 billion euros ($17 billion) in the program's one-year lifetime. En märklig sak med svensk politik är att stora skandaler kan inträffa utan att någon tar ansvar för dem. "I have long recognised my own contrariness (or is it bloody-mindedness) and hopefully put it to good use in my chosen profession. If you want the consensus bull-market cheerleading nonsense, readers know it is amply available elsewhere." I am neither monetarist nor Keynesian. I see merit and demerit in both sides of a very fractious argument. Sveriges riksbank sprutar in dopningsmedel i kreditmarknaden med en extremt expansiv penningpolitik för att få igång inflationen. Men det går inte utom på bostadsmarknaden där prisstegringarna ses som en samhällsfara. Finanspolitiken har i vårt land liksom i andra hållits fången av en doktrin som med anspråk på vetenskap säger att penningpolitik är det enda styrmedel som kan åstadkomma både stabilitet och tillväxt. Doktrinens resultat kan vi nu se i en värld som skakas av kriser och utebliven tillväxt. Lars Tobisson har gjort en värdefull insats genom att skriva en bok som kommer att bli standardverket om kampen om löntagarfonderna. Så här i efterhand kan det, i synnerhet för de som är födda på 70- och 80-talen, eller än senare, framstå som obegripligt att socialdemokraterna och LO i början och mitten på 1970-talet lade fram förslag som skulle ha lett till att Sverige blivit socialistiskt, nästan som Östtyskland, om ungdomarna vet vad det var. Rekordåren avlöstes runt 1968 av vänstervågen. Olof Palme besökte Fidels Castros Kuba 1975. Den I5 april 1975 intog Pol Pots styrkor, med blivande talmannen Birgitta Dahls gillande, Kambodjas huvudstad Pnom Penh och inledde masmordet känt från filmen Killing Fields. Den 30 april 1975 lämnade de sista amerikanska trupperna ambassadens tak med helikopter och Saigon intogs enligt myten av FNL eller VietCong som de själva också kallade sig. I själva verket intog Saigon av Nordvietnamesiska trupper med ryskbyggda stridsvagnar. The business models of German financial institutions depend critically on the presence of positive nominal interest rates. German life insurers have to guarantee a minimum rate of return, which is now 1.25 per cent a year. This is hard to do when the yield of the 10-year German government bond is only 0.13 per cent. Clearly, the idea that large corporations precisely calculate the interest rate at which they are willing to undertake investment – and that they would be willing to undertake a large number of projects if only interest rates were lowered by another 25 basis points – is absurd. It should have been apparent that most central banks’ pre-crisis models – both the formal models and the mental models that guide policymakers’ thinking – were badly wrong. None predicted the crisis; and in very few of these economies has a semblance of full employment been restored. The ECB famously raised interest rates twice in 2011, just as the euro crisis was worsening and unemployment was increasing to double-digit levels, bringing deflation ever closer. We already know that in a world of declining cash flows, the primary source of funds to facilitated this behavior was debt issuance. In fact, as SocGen showed in a stunning chart last year, the only reason for the increase of net debt in the 21st century has been to fund buybacks. after nearly six years during which the fund’s reputation has taken a battering. Although Athens and its eurozone partners agreed to a third bailout in July, the IMF has not yet signed up. Germany has repeatedly warned it may no longer be able to support the deal if the IMF quits. 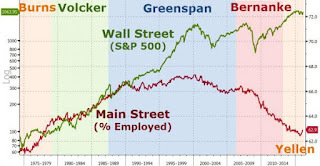 Ben S Bernanke is the one who falsely insisted that Great Depression 2.0 was just around the corner in September 2008. Along with Goldman’s plenipotentiary at the US Treasury, Hank Paulson, it was Bernanke who stampeded the entirety of Washington into tossing out the window the whole rule book of sound money, fiscal rectitude and free market discipline. The Lehman failure essentially triggered a self-contained leverage and liquidity bust in the canyons of Wall Street, and it would have burned out there had the Fed allowed money market interest rates to do their work. That is, to rise sufficiently to force into liquidation the gambling houses like Lehman, Goldman and Morgan Stanley that had loaded their balance sheets with trillions of illiquid or long-duration assets and funded them with cheap overnight money. There would have been no significant spillover effect. The notions that the financial system was imploding into a black hole and that ATMs would have gone dark and money market funds failed are complete urban legends. They were concocted by Wall Street to panic Washington into massive intervention to save their stocks and partnership shares. BlackRock chief Larry Fink negative and low interest rates around the world are crushing savers, and those policies are "going to become the biggest crisis globally." Fink called on political leaders to step in and provide fiscal reform to complement monetary policy. "We have become too dependent on central bankers" to boost the global economies, he said, stressing easy money policies were supposed to be a temporary healing. "I don't call seven, eight years temporary. ... I don't see how that [still] has a positive impact." "Over 70 percent of our clients are retirement plans and insurance plans. "Our clients are very worried how they're going to be meet their liabilities" because the yields are so low in the bond market. Stockman: China's apparent prosperity is not that of a sustainable economic miracle; its the front street of the greatest Potemkin Village in world history. The world economy is suffering from a glut of savings relative to investment opportunities. Why does such a savings glut exist? That is the important question. Given its current account surplus of almost 9 per cent of gross domestic product — that is, savings far in excess of what it absorbs domestically, even at ultra-low interest rates — Germany might ask what its domestic interest rate would be if it had to absorb this glut at home. Unfortunately, the rest of the world cannot absorb these savings easily either. Fiscal policy should have come into play more aggressively. Indeed, it is hard to understand the obsession with limiting public debt when it is quite as cheap as it is today. I don't hate to say it. Simon Wren-Lewis has just asked the important question of whether their bad policies will erode central banks’ independence from political interference. and their unwillingness to stimulate growth more today. If central banks repeatedly commit errors that cause so much harm to the economy, Wren-Lewis argues, it becomes hard to justify their independence from electoral politics to citizens. Can central banks make 3 major mistakes in a row and stay independent? In many countries like Sweden and UK people tend to like low or zero interest rates because they have invested heavily in housing with borrowed money. But in German most people rent their flats and have put their money in savings accounts or insurance. That is the background for an interesting article in Der Spiegel. - In hardly any other euro-zone country is the financial investment sector so dominated by savings accounts and insurance policies. It is mostly life/retirement insurance policies that are suffering. Insurance providers have primarily invested their customers' money in sovereign bonds. But returns are extremely low, in part because of the massive ECB purchases of such bonds. The idea of pumping money directly into the economy, Draghi said, was a "very interesting concept," with a helicopter to distribute the money across the country if necessary, as economists have half-jokingly recommended. German money being thrown out of a helicopter: It would be difficult to find a more fitting image to show people that the money they have set aside for retirement may soon be worth very little. A few weeks ago, Finance Minister Wolfgang Schäuble warned the ECB head that his ultra-loose monetary policies could "ultimately end in disaster." The fact that Schäuble said anything at all is rather surprising, as were the words he chose. Moody’s said the “profitability and solvency” of the industry in Germany would come under further strain from the European Central Bank’s bond buying. German life companies, which have estimated liabilities of more than €700bn, sell policies that offer annual guaranteed returns to policyholders, who use the products to save for retirement. Negative interest rates risk hitting consumer spending and undermining the economic growth they are intended to encourage, the head of the world’s largest asset management group has warned. Larry Fink, chief executive of BlackRock, said that not enough attention was being given to the effect of negative rates on saving habits in a downbeat annual letter to his shareholders. Mr Fink said that low rates were preventing savers from getting the returns they needed to prepare for retirement, so they were increasingly being forced to divert money from current spending into savings. When Mr Volcker was at one point asked if any of his successors had put too much “vodka in the punch bowl” by running excessively lax policy, he merely responded that he looked at them with “great awe”. Both Mr Bernanke and Mr Greenspan chimed in that they did not see a looming risk of recession. The Fed decides what money is worth and who receives it and how much. The Fed prices it at zero interest rates, allegedly to stimulate economic growth. But whenever something is free, it's distributed by queue, and only the privileged, connected people in the front of the line get any, not the innovators who create growth and opportunity for Main Street. Trump voters are wrong if they blame Mexico and China, but they are right about one big thing: The economy is rigged against them. George Gilder, author of "The Scandal of Money"
Vice President Biden underscored the need for Europe to follow through on its commitment to put Greece's debt on a sustainable path through debt relief. The unintended consequence of many central banks pushing negative interest rate policy is conjuring deflationary headwinds, stronger currencies, and slower growth — the exact opposite of what struggling economies need. But when monetary policy is the only game in town, negative rates are likely to beget even more negative rates, creating a perverse cycle with important implications for investors. Learn to say ‘I don’t know.’ If used when appropriate, it will be often. published by WikiLeaks about what it would take to get Greece's creditors to agree to debt relief. – Vi vill bromsa skuldsättningen men utan att sätta krokben för bostadsmarknaden eller Sveriges ekonomi, säger Henrik Braconier, chefsekonom på FI. Det är väl det konststycket som de flesta av världens centralbankschefer försöker hitta på hur det skall gå till. The day after the 1987 crash (Oct. 20, 1987) Alan Greenspan, Chairman of the Fed, announced to the world that The Fed stood ready to provide whatever liquidity was needed by the banking system to prevent the crash from turning into a systemic financial crisis. Fed Funds Rate drop from 6.5% to 1% from 2000 to 2003. This in effect morphed the tech stock bubble into a housing bubble. Large investment banks, like Bear Stearns and Merrill Lynch, became insolvent and were forced to merge with better capitalized banks. Lehman Bros. was allowed to fail and brought the global financial system to its knees.